Careful planning measures must be put into place to ensure small wind turbine developments do not cause bat and bird population decline, according to new University of Stirling research. 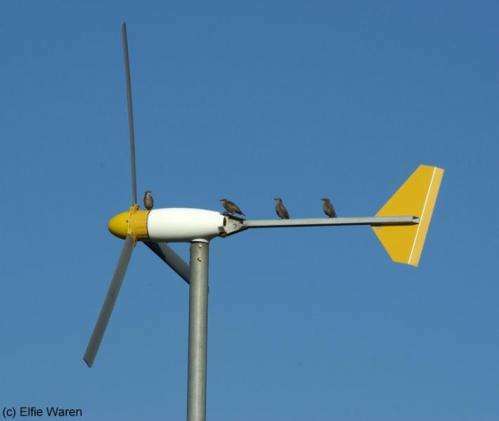 Small domestic wind turbines or 'microturbines', which can kill bats and birds, are becoming an increasingly popular means to generate clean energy for home owners. The Stirling team, whose research was published recently in the online journal Biodiversity and Conservation, found that the careful positioning of these turbines – and the avoidance of installing them in areas where bird or bat activity is likely to be high – is vital to ensure rare species of wildlife are not forced to abandon their homes in search of safer habitats. Although previous research has shown that birds and bats may be killed in significant numbers by colliding with turbines in large wind farms, the Stirling research – carried out in collaboration with the British Trust for Ornithology and funded by the Leverhulme Trust – is the first study to examine whether small wind turbines could have a similar impact on wildlife. Dr Jeroen Minderman from the University's School of Natural Sciences said: "Bird and bat deaths are a reality at small wind turbine sites. "Whilst our findings show the relative extent of this problem is much smaller than other causes of wildlife deaths, such as cats or road collisions, our previous work has shown that bats avoid microturbine development areas - which may explain the relatively lower number of bat deaths estimated." Dr Kirsty Park, who led the Stirling research team said: "While our estimates of bird and bat deaths may seem high, it is important to realise that this is across a range of species and across more than 19,000 small wind turbines currently installed in the UK. Moreover, such estimates are several orders of magnitude lower than estimated numbers of deaths due to other human-related causes. "However, this avoidance of microturbine sites by wildlife might have an adverse impact on rare or sensitive species if it causes bats to abandon what would otherwise be suitable feeding areas." She stressed: "Appropriate siting decisions that avoid such effects are therefore very important, and our work can help inform this." The increase in installation of such turbines is due to rapid technological developments and the introduction of financial incentives in the form of feed-in tariffs: schemes which pay people for creating their own 'green' electricity and offer additional bonuses for exporting electricity into the grid.